A gate valve, also known as a sluice valve, is a valve that opens by lifting a round or rectangular gate/wedge out of the path of the fluid. 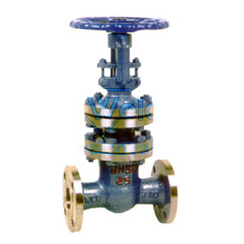 Gate valves are characterised as having either a rising or a nonrising stem. Rising stems provide a visual indication of valve position. Non-rising stems are used where vertical space is limited or underground.